Sometimes finances can be so taboo to talk about. I kind of feel like it’s a hush-hush subject. It can be this quiet comparison. I just love you and I want to give you hope! I simply want us all to get the momentum to live real, authentic lives of financial freedom so we can do all God has asked us to do! That’s why I love Dave Ramsey’s debt free screams. I get to hear concrete numbers and scenarios that give me motivation to get in control of this debt and out finances. Cash – that I pull out to put into my envelopes each week for food, gas and household supplies. In my excel spreadsheet I set $____ amount for every category, every month. I usually allot an amount high for each month’s “start template” (this is so that I have a ballpark figure before the month begins). Example: $90 for our house gas, and in the summer months it can be as low as $30. Woohoo! That means I save $60 and that goes into the DEBT fund. That’s our #1 focus. I have budgeted this way for years and it works for me. Dave Ramsey suggests having every month be its own unique budget. Ours ends up being its own unique budget but I always start with that ballpark figure template. This is an incredible way to take control of your finances. So why do all of this? Because I have a dream! Read about it here if you haven’t yet. 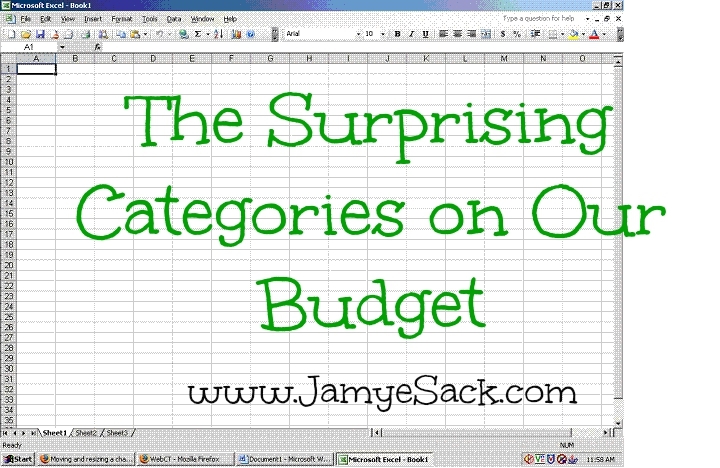 Therefore, what’s surprising about our budget you ask? Ha! Not much! 🙂 I guess it’s not too fancy and anyone can do a monthly budget! So be encouraged and get to budgeting!